NASA’s Solar Dynamics Observatory just released a stunning video showing a pair of magnetic fields as they duel for supremacy on the surface of the sun. The video, shot in extreme ultraviolet light, highlights a small but increasingly active region on the stellar surface. Shot over the course of a single day (May 30, 2016), the spidery magnetic fields are seen connecting and reconnecting as each struggles to overtake the other. To capture images and videos like this, the SDO uses telescopes that image the sun in the ultraviolet spectrum. As these beams of this invisible light pass into the telescope, a special mirror is used to amplify the light’s otherwise poor reflection. The incoming photos are recorded as pixels, and then recoded as electrical signals. 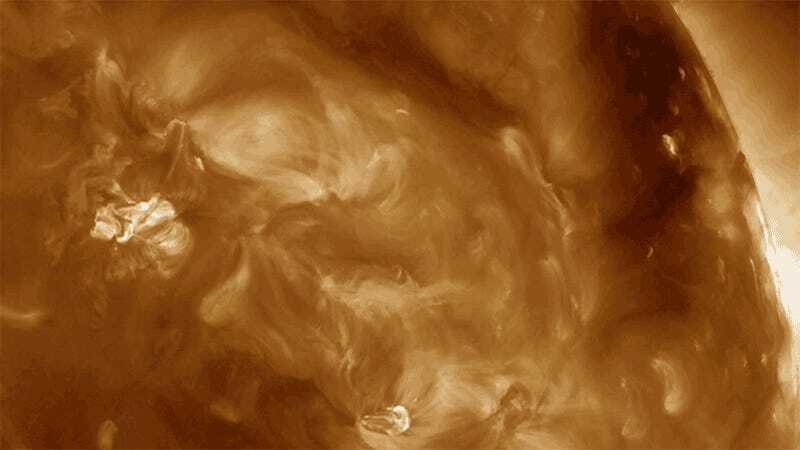 Earlier this year, NASA produced a map showing the complex configurations expressed by the sun’s magnetic fields. These lines are in constant flux, changing in response to the sun’s movements, both inside and on the surface. As shown here, many of the field lines link one active region to another.